Put 1 and 1 on your starting board in the highest-numbered Jungle. Put 1 in a land of your choice with anywhere on the island. All about Beasts and Jungles. Can be very fast out of the gate, but doesn't have the late-game power that some spirits do, and is likely to have some difficulty with Blighted areas. "Ranging Hunt" is a critical Innate ability, particularly in early-game: it simultaneously gives Beasts mobility and permits picking off a stray Explorers or Towns on most turns. Part of the Branch and Claw Expansion. 2 You may Gather 1 . 2 3 1 Damage per . 2 You may Push up to 2 . 1 1 4 1 and 2 Damage. Remove 1 . 1 2 5 +1 and +1 Damage. Sharp Fangs Behind the Leaves is a predator-spirit, half-seen stalker in the jungles, hunter of prey large and small. This most emphatically includes humans - though a pair of heroes long ago won the Dahan the status of "not entirely prey", and with it an uneasy semi-reprieve from its more active predations. Still, the Dahan know better than to stick around too long when it moves into an area to stay. Where it lairs for any length of time, the jungle becomes a hunting-grounds, and not just for its own hunts - Sharp Fangs can bring the aggressive and predatory instincts of other animals to the fore. Creatures that ordinarily might be dangerous only when provoked become actively marauding threats, or even driven into a berserker frenzy if it suits Sharp Fangs' purposes. It's not that it lives for the hunt and the fight: it is the hunt and the fight, the way that Lightning is lightning and Earth is earth. A predator-spirit of the jungles, a stalker and hunter of animal and human alike. 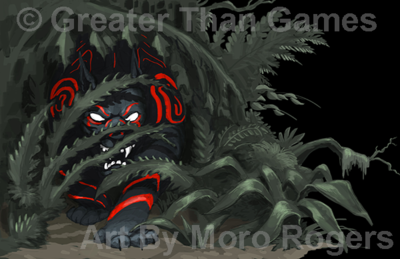 Wherever it lives, savage beasts emerge to hunt, and the jungle grows dark and ominous. Sharp Fangs doesn't bother talking to the Dahan. Sometimes it will hunt them, or run them off, but for the most part it ignores them. The Dahan's legends tell of a time when Sharp Fangs hunted them more actively, until a pair of warriors - twins, sister and brother - drove it off with traps and guile, then turned the tables and hunted it down. Since then, it has seen the Dahan as not-entirely-prey, which, for it, is something akin to respect. You may Gather 1 . If target land has Invaders do not Build there this turn. Push 2 / / . Push another 2 / / per in target land. IF you Pushed any Invaders, 2 . Growth: It gets two Growth choices rather than one, giving it great versatility. However, reclaiming cards costs it Energy to do, meaning it needs to keep an eye on its reserves when it's running low on Power Cards. Adding Presence: It's very limited in where it can place its Presence: only in Jungles and lands with Beasts! However, its Ally of the Beasts special rule can move Presence along with Beasts tokens, which gives it some mobility after placement. Presence Tracks: It's not a high-Energy powerhouse, but it has very good Card Plays: it starts with 2, rises to 3 rapidly, and has an early Reclaim One spot. Sharp Fangs Behind the Leaves is going to excel at a many-small-Powers style - fast and furious! Innate Power - Ranging Hunt: Each level of an innate power that you get is performed in order. So if Sharp Fangs has the full complement of 3xAnimal and 2xPlant, it can Gather a Beasts token into a land, then do 1 Damage per Beasts token, then Push up to two of the Beasts tokens elsewhere, setting up for next turn. Ranging Hunt is phenomenally good at picking off stray Explorers, and with setup can take down Towns or sometimes even Cities; it also lets Sharp Fangs position Beasts tokens for Presence placement, to benefit from Beast-based token events, or to make use of Beast-centric Power Cards. However, it can't target Blighted lands. Innate Power - Frenzied Assault: Not as easy to trigger as Ranging Hunt, Frenzied Assault incites Beasts to a full frontal assault on the Invaders. The Invaders kill off the Beasts, but are apt to take heavy casualties in so doing. Everything has +Animal. Two have +Plant and two have +Moon, with a splash of Fire and Sun. Triggering Ranging Hunt isn't going to be too hard, though early on Plant may be an obstacle. With only one Fire, Sharp Fangs will have to find more to hit the higher level of Frenzied Assault - ideally paired with Animal. It likes being in Jungles. Two of its Unique Powers can only be used from Presence in Jungles. It benefits from being up close + personal with the Invaders: two of its Unique Powers are range 0. There's a moderate amount of Fear. This is good; it's excellent at picking off Explorers, which doesn't do any intrinsic Fear - but Sharp Fangs Behind the Leaves is scary. Nothing costs more than 1 Energy. This supports (but does not require) a Play-heavy, Energy-light strategy. Prey on the Builders isn't just a way to prevent Build - it's also a way to move Beasts at fast speed, which could help set up a Ranging Hunt. Teeth Gleam From Darkness gets more Beasts onto the board without having to lose Presence. Sweet! Or, if there are enough Beasts out already (is that ever true for Sharp Fangs?) it can be used to intimidate the Invaders yet further. Like Ranging Hunt, this can't target Blighted lands - Beasts don't like going there. Too Near the Jungle offers more ability to take down Explorers. Unlike Ranging Hunt, it's Slow, so it'll be trickier using it to control Invader Builds. Terrifying Chase includes Sharp Fangs Behind the Leaves' sole interaction with the Dahan: running them off. All told, though, chasing the Invaders off is usually more useful, and with some Beasts tokens around, Sharp Fangs is exceptionally good at it. Note that unlike many Push powers, the words "you may" or "up to" do not appear: when you start in on the hunt, a whole bunch of people are going to run away. Overall: Sharp Fangs is exceptionally good at keeping the Invaders from taking over new lands, through a combination of eating Explorers and its Power Card "Prey on the Builders". It's fast out of the gate, then continues to grow slowly in power, especially as more Beasts come onto the board (giving it more options). Some of the low-cost Major Powers which use Beasts are very appealing for it, so it may go looking for a Major Power or two, but is likely to focus more on Minor Powers due to its high level of activity (Card Plays). It does have trouble handling Blighted lands, which are immune to both Ranging Hunt and Teeth Gleam From Darkness, so may want to draft some Blight removal if its allies don't manage to do so first. This page was last edited on 18 July 2018, at 13:48.